Warning: There are a LOT of images in this post. If you get upset about posts taking too long to load, leave now. 🙂 Otherwise, enjoy. This is part of a seven-post mini-series that will explore our journey in selling and buying a used car. You can scroll to the bottom of this post to explore the entire series. Most of you know that I’m a huge fan of Consumer Reports. In my estimation, I use it as a basis for 80% of my non-daily purchases. I find the advice to be trustworthy, and the fact that every purchase based on my research has panned out exactly as planned only serves to reinforce that trust. 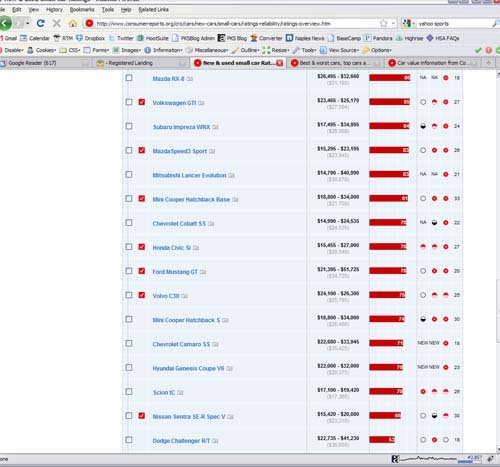 This post will show you some of the basic tools available to you as a customer of Consumer Reports Online, and how we used them to make the most of our car-selection experience. 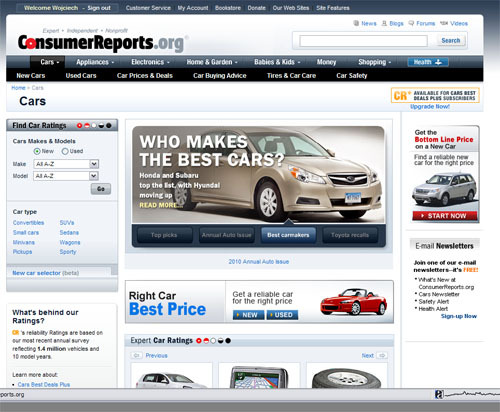 The first thing you’ll see when you arrive at the Consumer Reports car section is the front page. From here, you can directly explore car ratings, go to a specific section, like “new cars,” or “used cars,” read the latest advice columns and rating features, and pretty much navigate to any of the other sections that I’ll describe below. If you’re new to Consumer Reports, some of the test track videos are worth watching, since they explain exactly how the company tests cars and what they look for. If you’re just starting our in your car search, this is a perfect section. It walks you through the entire process, including choosing a car, dealership tactics, pricing, trade-ins, financing, and more. 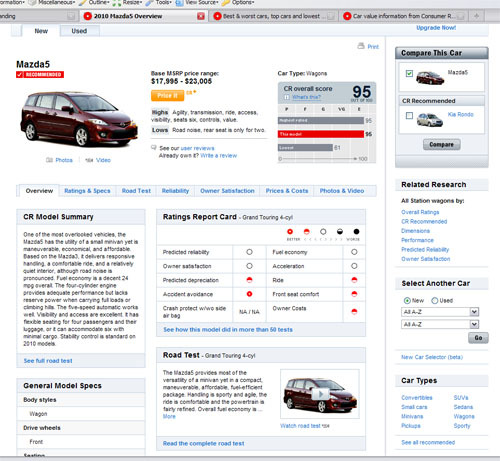 You can also explore special guides, like the fuel economy guide, or the results of the brand perception survey. 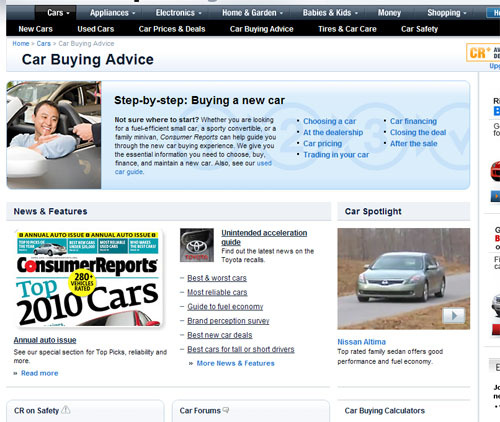 Navigating to the new cars or used cars pages takes you directly to the center of your car selection experience. 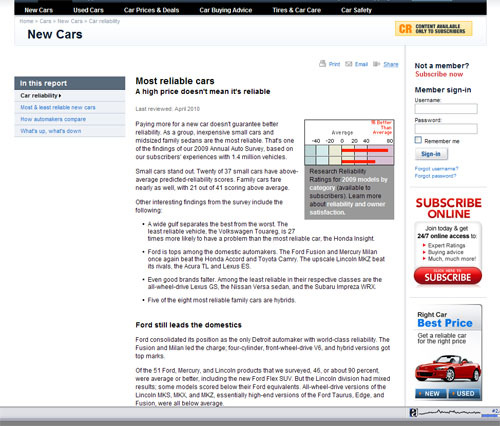 From here, you can explore various “top 10” guides, view car ratings by body type, access the new car selector, and more. If you’re unsure of what kind of car you want, but have a vague idea of what you don’t want, the new car selector may be a good idea. This experimental tool lets you choose the body type and price range you want to narrow your search to, and displays only those results. 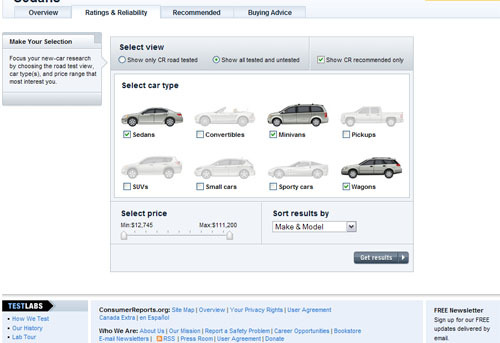 Checking “Show CR recommended only” will limit the results to only those cars that have been recommended by Consumer Reports–another great time saver (since you’re probably on the site to find those cars anyway!). This is where it gets good–if you know the specific body type of car you’re looking for, these guide pages show you more information about your chosen category. Since we were looking for wagons, reading about the different types, features, and brands available (as well as how well they rate, in general terms) gave us some surprising facts to think about. These pages walk you through the basics of what you can expect from that body type “family,” and specific cars to look for or avoid within the category. 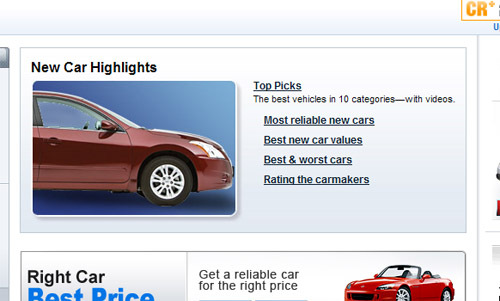 If you still don’t have the patience for ratings, but just want to see the best station wagons available, the “recommended” page in any car section gives you the cream of the crop. Best selections are usually divided into “overall,” and a variety of other sorting categories, in this case–small, three-row, all wheel drive, or reliable used. If you do dig into the ratings page, you can see how each car compares to its competitors in any category or sorting method you choose. This page shows you the car name, price range, rating, and a variety of quick-glance ratings, like reliability, owner satisfaction, accident avoidance, and average MPG. Finally, this is the “meat” of Consumer Reports–the individual product page. If you have a specific model in mind, or select one during your travels through the CR guides, this is the page to ultimately check out. It will show you photos of the car, expected prices (for new and used), highs and lows of the test drive experience, detailed ratings and reliability per model year, a road test video, and model and safety specifications. There’s enough information here to spend a few days with, but it’s a fantastic tool to narrow down choices, explore new avenues of thinking, and make a final selection. I hope this gave you a good overview of what Consumer Reports is all about and some of the basic tools available to you when selecting a new vehicle for your family. It definitely helped us in our journey, and for the subscription price, I would recommend it 100% for almost anyone! Would You Buy a Rental Car? Next Post Would You Buy a Rental Car? 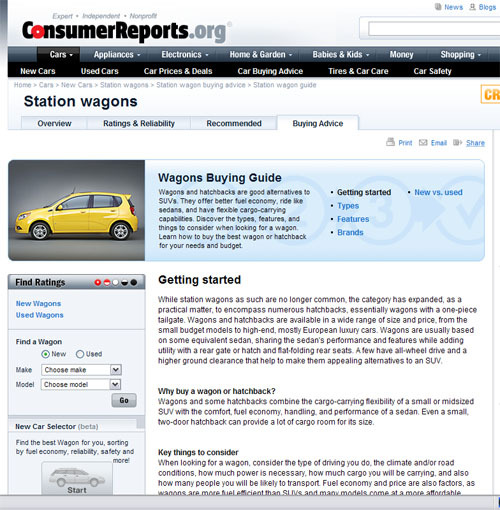 I used the consumer reports once to help me buy a car. It was the worst car I ever owned. I guess it was just a lemon, but goes to show that no matter how much research you do you can still end up with a junk car. .-= Craig Ford´s last post: Christian Blog Roundup =-. 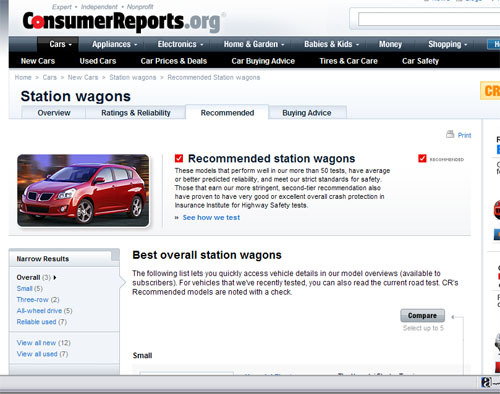 rather than simply use consumer reports, I’d actually ask a few mechanics in your areas to tell you which cars to avoid. They repair cars, so they should know..this is insider’s information at it’s best! .-= Mr Credit Card´s last post: The Card For The Rest Of You =-. Good point, and I did find that helpful in trying to figure out which cars to avoid. When it came to which cars to look for though, the advice was much slower to come. I think this is where CR helped the most. I just bought a new Volvo XC90. I had so many discussions with the dealers and negotiations…I was so tired of talking to them at all. Then I ordered the consumer reports new car report for $14 and these were probably the best spent $14 of my life. Contacting the dealers through that website, the whole thing went the opposite direction, the prices were going down and down until I finally got a price no other dealer was willing to beat. I loved it! Thanks CR!! !